When I was a kid, four toylines ruled my bedroom. Star Wars, G.I. Joe, He-Man and M.A.S.K. All of these franchises were my safe haven. Like plenty of others, my childhood was spent with these figures. They utilized my imagination, gave me countless hours of attention and most of all, would never let me down. Unfortunately, the same can not be said for the movies that stemmed from some these properties. Outside of Star Wars, the rest of these properties were either created from the toy, comic or cartoon series. The movies came later as a product of the toy i.e. cartoon. (Yes, M.A.S.K. has sadly never been optioned). Living up to all the years of playing with these toys in one movie is no easy task, and with He-Man, the results haven't been so good. Let's be straight, the first 1987 He-Man movie titled, Masters of the Universe is crap. 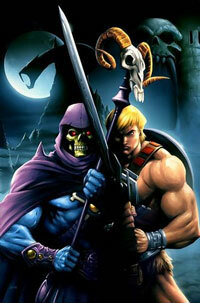 I like the movie for what it is, but it is no where near what I'd want a He-Man movie to be. The question now is, will Mike Finch and Alex Litvak be able to meet both Columbia Pictures and Mattel's approval? The writers are hoping they can, "balance a treatment that would convince the studio it was cinematic and keep the toy company satisfied that its characters were being portrayed appropriately." Warner Brothers had tried previously with Kung Fu Panda director John Stevenson to get a He-Man movie made, but that project ended up being scrapped when Mattel and WB couldn't see eye-to-eye. Whose to say the same won't happen here, at the very least, Finch and Litvak are hopeful they can do the property justice while appeasing both sides.